Apples are as classic an American fruit as, well, apple pie. The many varieties of apples guarantee home gardeners that they can grow a tree that suits their taste buds and climate zone, although apples will grow almost anywhere in the continental United States. From the crunchy, tart “Granny Smith” apple that is a favorite for pies to heirloom varieties such as the Arkansas twig, apples are a versatile, nutritious fruit and their trees are generally easy to grow. Proper pruning in fall or winter will assure a bountiful apple crop the following summer. Wait for your apple tree to drop all of its leaves in fall before you begin to prune it. Make certain that it has entered its winter dormancy before you begin. Prune newly planted trees to a central leader, which will help your tree to develop a strong trunk and main branches. Cut the trunk to within about 3 feet of the ground and cut any side branches off the trunk that are closer to the ground than 2 feet. Also cut any other side branches to within 2 to 4 inches of the trunk. Prune all branches except three to five strong, evenly placed branches on young trees their second fall in the ground. You can also prune back the central leader to ensure that your tree develops a pyramid shape. Cut dead, broken or diseased branches from older trees when you first begin pruning. Then cut off any suckers that emerge at ground level. Next, cut branches that point upward or downward and ones that cross over or rub against other branches. Always cut branches back to the main trunk, avoiding the branch collar. Keep lower branches a bit longer than upper branches to maintain the tree’s desirable pyramid shape. Prune neglected trees that have not been pruned in several years to encourage their health and stimulate fruit production. Cut off all upright shoots where they emerge from the branch in order to open up the tree’s central area and let more light into the tree. Select three to five healthy lower scaffolding branches and remove all others. Also prune off all suckers, dead or damaged branches, competing leaders and branches that point upward or downward. The branch collar is a bulbous area where the branch connects to the trunk. Always cut on the branch side of the collar and do not cut into it when pruning. 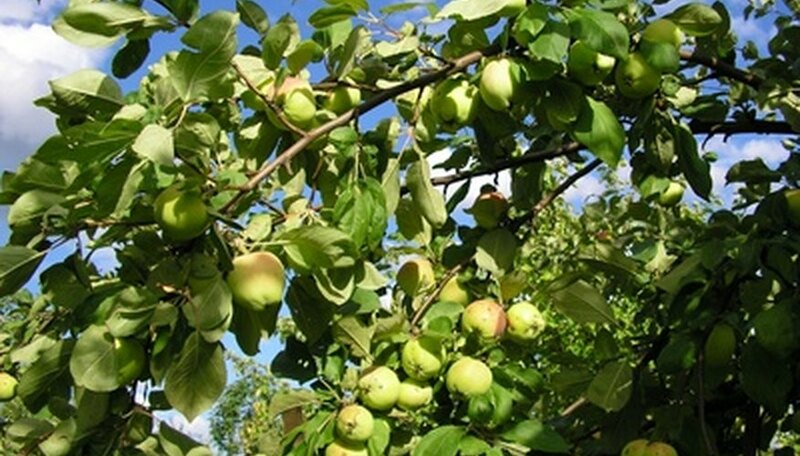 Apple trees form flowers and resulting fruit on old wood, so when you prune, concentrate on removing new growth, which will force the tree's energy into developing flowers and fruit. When you do corrective pruning on old, neglected apple trees, you might want to spread your work over two or three fall pruning seasons to prevent shock to your tree and to lower the possibility of a severely reduced harvest the following season. You do not need to use pruning tar to seal cuts. Be careful whenever you use sharp cutting tools. Also be careful if you must climb a ladder to prune your apple tree.